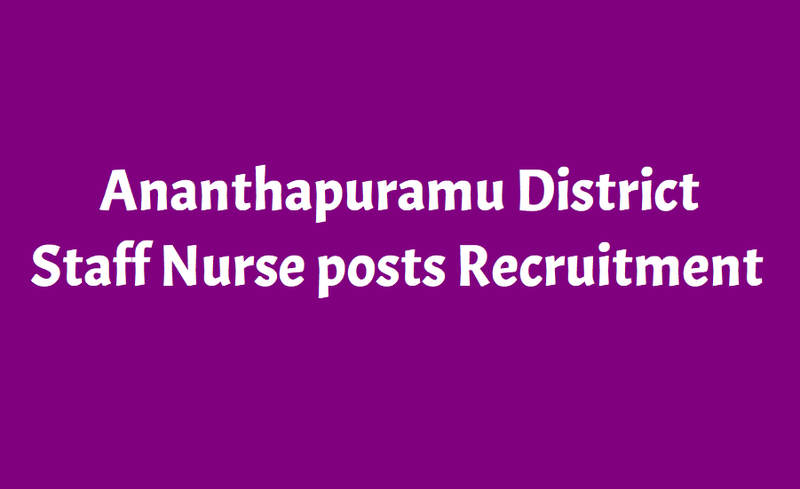 Ananthapuramu Staff Nurse posts recruitment 2018 in DCHS and DMHO ATP: Government Of Andhra Pradesh, Office Of The District Coordinator Of Hospital Services, Ananthapuramu (A.P Vaidya Vidhana Parishad) has given the Recruitment for the post of STAFF NURSE (Female) to work on contract basis in NBSU / SNCU /NRC’s of Anantapuramu District and Applications are invited from the eligible and interested candidates for AP Staff Nurse posts recruitment on basis of follwing criteria. DCHS, Ananthapuramu has given the 23 Staff Nurse Posts Recruitment notification and Last date to apply is 26.12.2018. Office of the District Coordinator of Hospital Services, Ananthapuramu invites applications for the recruitment of Staff Nurses (APVVP) on contract basis to work at District Hospital, Hindupur, Anantapuramu Dist. Place of vacancies: District Hospital, Hindupur (APVVP) Anantapuramu District. a) Candidates must have completed Intermediate and G.N.M. (or) B.Sc. (Nursing) from the recognized institutions established under Nursing Council of India rules. b) Candidates must be registered in the A.P. Nursing & Midwifes Council. The Staff Nurse Post is a Zonal category post in regular recruitment, hence it is considered as local candidates as per study certificates from Class-IV to Class-X within the Zone-IV i.e., Ananthapuramu, Kadapa, Chittoor and Kurnool Dist., other than Zone-IV candidates will be treated as Non-Local category. a) 80 Marks based on merit obtained in qualifying examination i.e., GNM(or) B.Sc.(Nursing). b)10 Marks for the seniority from the year of passing of qualifying examination i.e., GNM or BSc(N). The following documents are to be enclosed along with application form at the time of submission without fail. 1. S.S.C or its equivalent (for proof of Date of Birth). 2. Provisional pass certificate of GNM/B.Sc. (Nursing). 3. Consolidated / Year wise marks memos of GNM/B.Sc.(Nursing). 4. Internship certificate if any. 6. Study certificates from Class – IV to Class – X (for local status). 7. A.P. Nurses and Midwives Council Registration certificate with having validity (Renewal certificate). 8. Disability (Physically Handicapped) certificate if applicable. 9. Certificate of Out-Sourcing Service in prescribed format (If working / worked on Out-Sourcing basis as Staff Nurse in any Government institution in AP State). 10. Demand Draft for Rs. 200/- (Rupees two hundred only) is to be drawn in any Nationalized bank in favour of “District Co-ordinator of Hospital Services (DCHS), Ananthapuramu.” Payable at Anantapuramu (SC/ST/PH categories are exempted ). 11. Regarding Sports Quota, the eligible candidate shall submit the relevant Eligibility Certificate issued by the District Level Sports Authority of concerned Districts as prescribed (proforma) in the G.O.Ms.No.74, Youth Advancement, Tourism & Culture (Sports) Dept., Dated:09.08.2012. How to apply: The filled in application forms shall be submitted in person/by Registered /Speed Post in the Office of the District Co-ordinator of Hospital Services, Govt.,General Hospital Campus, Anantapuramu on all working days from 13.12.2018 to 26.12.2018 between 10.00 AM to 05.00 PM. This office is not responsible for any postal delays. Applications once submitted will not be entertained for any changes i.e., insertion /deletion of any other documents. Incomplete applications i.e., missing applicant signature, without enclosing all the required supporting documents along with application will be rejected summarily. Only Female candidates are eligible for the post of Staff Nurses (on contract basis) in NBSU/SNCU/NRC’s under NHM Scheme. a) 90 Marks based on merit obtained in qualifying examination i.e., GNM(or) B.Sc.(Nursing). The Commissioner of Health & Family Welfare, AP has informed that, the Staff Nurse Post is a Zonal category post in regular recruitment. But in NBSU/SNCU/NRC recruitment will be done on contract basis only for the period of one year by the District Selection Committee for the local candidates belonging to Anantapuramu District. Hence, the candidates who have studied their school studies from Class-IV to Class-X in Anantapuramu District only will be considered for this post. The following documents are to be enclosed along with application form at the time of submission. 3. Consolidated Marks memos of GNM/B.Sc.(Nursing). 6. Study certificates from Class–IV to Class–X (for local status). The filled in application forms shall be submitted in person/by Registered /Speed Post in the Office of the District Co-ordinator of Hospital Services, Govt.,General Hospital Campus, Anantapuramu on all working days from 26.11.2018 to 05.12.2018 between 10.00 AM to 05.00 PM. This office is not responsible for any postal delays. Applications once submitted will not be entertained for any changes i.e., insertion /deletion of any other documents. Incomplete applications i.e., missing applicant signature, without enclosing all the required supporting documents along with application will be rejected summarily.